Cash or cheque in the drop box in the Chalet. Please bring exact change. Online using your credit card through Zone4. You can do this at home, or in the Chalet using your smart phone. Please note: the fee for using Zone4, regardless of how many day passes you purchase at one time, is $2 plus 3% for the credit card fee. Day Passes purchased online can be used on any ONE day this season. Multiple day passes purchased on one day cannot be used on multiple days. You must have your receipt number with you when you sign in at the chalet as proof of payment. 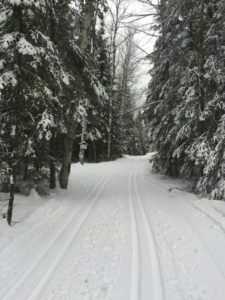 Your Day Use Fees include access to both Ski and Snowshoe trails. All skiers and snowshoers must sign in before using our trails. The sign-in book is in the chalet. Please respect our request to pay for day use of our trails. There are many expenses involved in maintaining our trails and providing this service for your enjoyment. Please share in the cost of running this non-profit club. Please note: Day Use Fees already paid cannot be used to offset cost of a full Club membership.